As a certified Invisalign® provider in Chino, Gavrila Dental proudly offers orthodontic treatment to patients in the Chino and throughout the San Bernardino area. This method of aligning teeth offers an effective yet discreet alternative to metal braces. Patients suffering from misaligned teeth can look forward to a treatment that is practically invisible. At our dental practice, we are proud to have Dr. Gavrila, who has been recognized as the premier Invisalign provider in Chino and continues to correct smiles for patients who choose this alternative clear aligner procedure. Dr. Gavrila or Dr. Alex take impressions of a patient’s teeth and create custom-fitted aligning trays that correct a range of concerns, including malocclusion, crossbite, and uneven teeth. After your treatment with Invisalign® at Gavrila, Dental is complete, Dr. Gavrila and Dr. Alex continue to monitor the longevity of the treatment to ensure patients receive comprehensive orthodontic care. 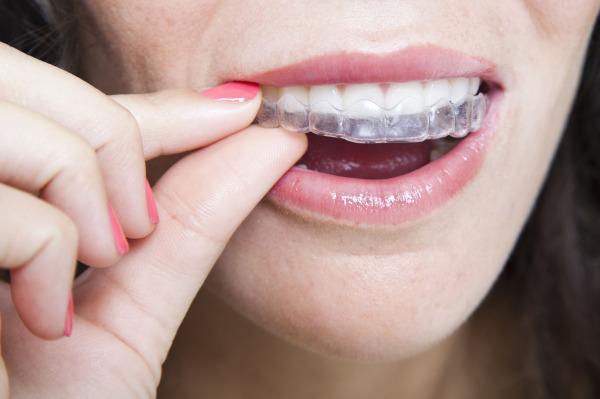 Invisalign® allows patients to remove their set of aligners, which can be especially beneficial when posing for photos or during other social and professional events. While the aligners require 22 hours of daily use to be effective, the ability to remove aligners is great for patients who are concerned about their appearances. Removing trays also allows for thorough daily cleaning. Metal brackets can get in the way of keeping teeth clean, often requiring additional tools to brush and floss. Invisalign® allows patients to clean hard-to-reach areas. Patients appreciate the capability to maintain regular dental hygiene. With Invisalign®, patients do not have to adhere to diet restrictions. They can bite into an apple or chew popcorn without fear of food getting caught between wires or breaking a bracket, accidents that usually costing patients more money for repairs. Additionally, this method of orthodontic treatment is practically invisible; patients can wear them the entire day without feeling embarrassed. Though traditional braces are still utilized to treat the most severe cases of malocclusion, Invisalign® works best for patients looking for orthodontic work to correct crooked, gapped, or crowded teeth. This orthodontic treatment remains a dependable and acclaimed option for many patients looking for better teeth alignment. To discover more about Invisalign®, or to schedule your consultation with Dr. Gavrila or Dr. Alex to find out how Invisalign® can help you, contact Gavrila Dental in Chino today!